Very firm, just the way I like it. 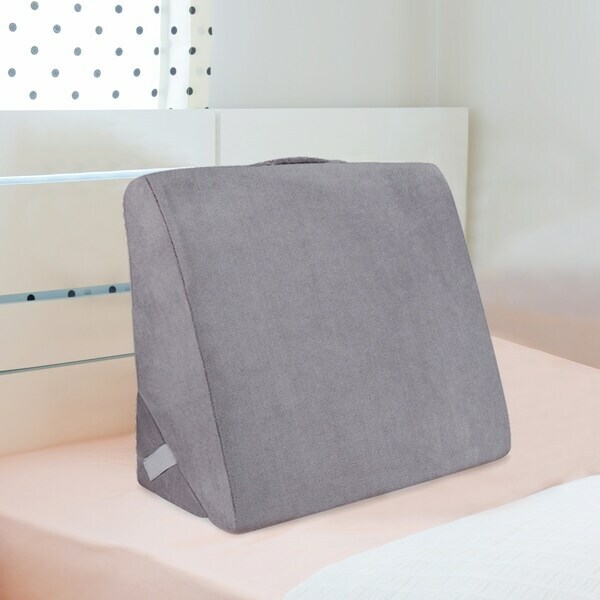 Sleeplanner Multipurpose Memory Foam Mattress Wedge Pillow features multi-use support by combining high-density memory foam in the core with ventilated memory foam for enhanced cozy support. Pillow is perfect for extra support when reading, lounging, watching TV, using a laptop or for knee support when needed. Simply the best bed wedge pillow for every single night! Dimensions 10.0 In. X 22.0 In. X 24.0 In. Exactly what I needed! I have problems with my neck, and needed something that would prop me up while I read in bed. The fabric is super soft on the outside, and the foam is firm and high quality. It's definitely worth paying a little more for. I bought this to help with my acid reflux problem. And it does a great job for that. I haven't had a single interuption of my sleep since I started using this wedge to raise my upper torso in bed. It has multiple positions so I can use it to watch tv or read in bed also. It is firm without being hard, comfortable for the whole night. We ordered two of those and don’t really find them very comfortable for sleeping. They are however nice for reading or watching TV! It is nice that the cover is removable and can be washed in the washing machine. So we have found use for them even if we don’t use them for what we intended them for. Very comfortable for sleeping on all night. Cover is made of a soft material. Delivery was quick. This was a great purchase! Wish I would have bought one sooner. I especially love the soft gray cover--very nice quality. Slept like a baby. Very comfortable and perfect height..
"Dors the back wedge come off (for i.e. knee support)?? It looks like it but there areno validating pici???"